What message does your restroom send to clients and customers? Don’t let them get the wrong impression! Business owners who let the restrooms go without working them into the budget so they can “save money” are basically saying, “It’s all about the money.” Or, at least that’s what visiting customers, clients, students or patrons may think. On the other hand, a clean, tidy, well-organized and nice-smelling restroom can say just the opposite—you actually care about the wellbeing of those you work with and for! Think of this from the customer’s point of view: attention to detail is crucial! If your restroom is any indication of how you approach, say, customer service (and really, the restroom DOES impact customer service), or product quality, you don’t want customers, in a moment of need, to walk into a reeking, slippery restroom where the soap dispensers don’t work. This could negatively impact how they perceive your entire business, your products and your service. On the flip side: a customer may not pay close attention just how clean and functional your restroom is (they expect it to be a foregone conclusion), but they will absolutely notice a sanitary, complementary swig of mouthwash. That’s a company that cares deeply about the details - and gives off a very good impression! Remember, that restroom hygiene and cleanliness isn’t just about being “pleasant”. It’s also about being sanitary, healthy and environmentally responsible. A dirty restroom, or one in which the dispensers are broken or empty is an unsanitary restroom that can lead to the spread of all kinds of germs that can make people sick, which can impact the entire community and environment. On the other hand, if your regular restroom service keeps the soap dispensers pumping and the recycled paper towels full, people can wash their hands and prevent spreading germs, keeping everyone who enters your business healthier, positively impacting your entire community! Nature can call at any time, so having a clean restroom to offer your clients as a part of your customer service to them can help a customer realize just how much you care and are willing to put into making them comfortable. People form entire business relationships on things that aren’t always logical or even to do with products themselves. Put yourself ahead of the competition by maintaining this part of your business so that you can offer help and value to your customer in more ways than they expect. A well-maintained facility is a sign of hard work and efficiency. If someone has to use the restroom and it’s a disaster, unsanitary or smelly, this will definitely leave people with the opinion that you aren’t as hard working and efficient as you could be. If customers can depend on the cleanliness of your restrooms, however, that’s a sign that they view you as a hard-working, efficient business that they can trust. Cleanliness matters to everybody. The level of personal and professional cleanliness can literally impact health and safety. If you are a business that provides food, medicine, or takes care of people in any way, then cleanliness is of paramount importance! A clean restroom can tell people that you are absolutely focused on maintaining a safe, sanitary working and business environment! 7. Bottom Line: Do You Want Your Customers to Return? Restroom cleanliness can say a lot about a company’s customer service and the quality level of their products. Delightful customer service, excellent product quality and a clean, fresh, sparkling restroom can make customers want to come back again soon, and tell their friends to tag along with them! 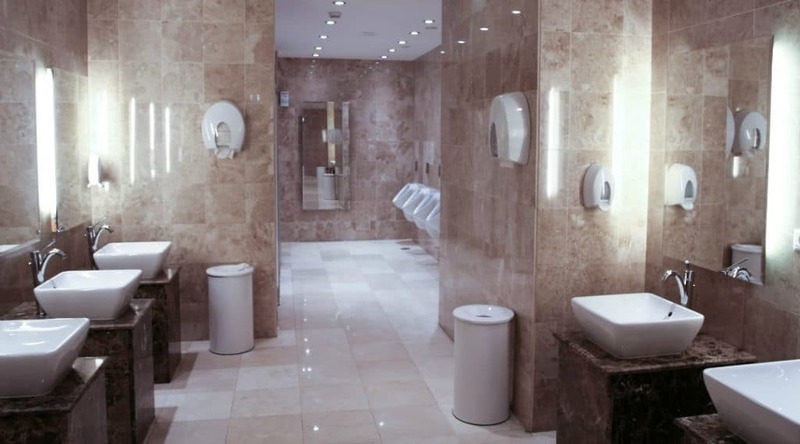 If restroom cleanliness is something you’re concerned about, and if it’s impacting your customer relations, then just contact Loyal Workplace Hygiene Solutions today at (703) 361-7888 and we can help you change that so that you give your customers the positive impression you want them to have!